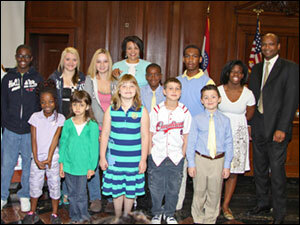 Since its inception, more than 25,000 area school children have been nominated for Do The Right Thing Awards. Though only 10 are selected each month to attend the ceremonies, other nominees are honored at their schools with special ceremonies and prizes. The Department’s continued support of this program assists area students by encouraging them to “Do The Right Thing” and become outstanding St. Louis citizens. 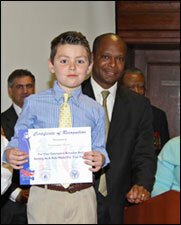 In 2009, 120 students were honored with official recognition for the program. Tiffany, a middle school student, was recognized for her bravery during a fire at her home. Tiffany realized her bed was on fire but was able to exit her room. She then crawled to alert her mother and three siblings, saved the family dog and called 911. Everyone made it out of the house safely as a result of Tiffany’s actions. Darnell, a high school student, was honored for his courage and bravery. Darnell was visiting at a friend’s house when the front porch began to collapse. He quickly noticed a small child who would have been crushed by the debris and grabbed the child. While Darnell and the child did incur minor scrapes and bruises, Darnell’s actions prevented both of them from being seriously injured in the accident. To read about more outstanding students or for more information about Do The Right Thing, please visit the program’s website http://www.dotherightthingstl.org/ . Since 1994, the Department has partnered with the St. Louis County Police Department, KMOV-TV, Suburban Journals and The Cooperating School Districts of Greater St. Louis, Inc., to participate in the “Do The Right Thing” program. Do The Right Thing provides recognition to children who have been nominated by teachers, parents and neighbors based on their good behavior, heroic acts and service to the community.